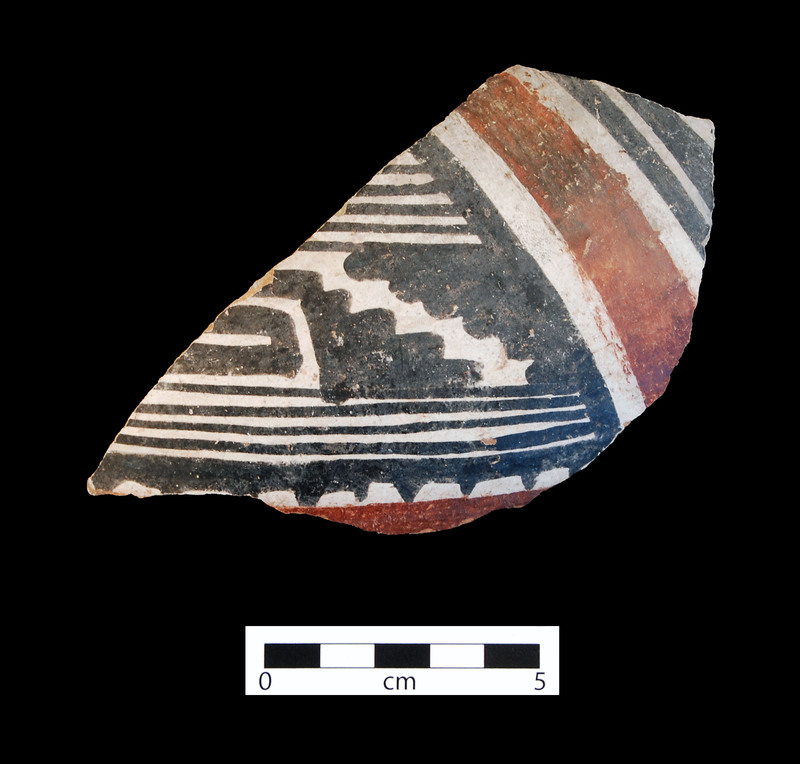 Tonto Polychrome jar sherd. Click the image to open the Tonto Polychrome gallery. 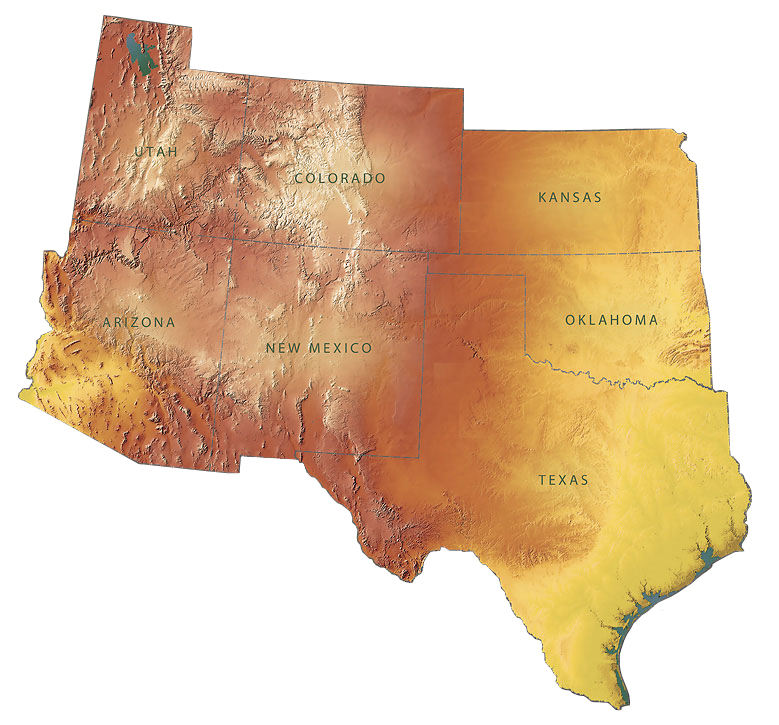 Tonto Polychrome is one of the most common types of Roosevelt Red Ware and was widely distributed across the Southwest, but most abundant in the Roosevelt Basin and in the vicinity of Globe, Arizona. Core Color: Brick-red, tan, gray to black. Temper: Moderately abundant fine water-worn sand. Bowl interiors: well-smoothed, coated (usually all over) with thick (creamy white) slip, unpolished, somewhat gritty, often crazed, rarely (white) slip covers band extending from rim downward two to three inches, remainder area coated with red slip. Bowl exteriors: coated in part with white slip, in part with red slip, latter usually fairly well polished. Jar interiors: well-smoothed, Jar exteriors: same as bowl interiors. Surface Color: Bowl and jar exteriors, red in part, white in part; bowl interiors creamy-white. Paint: Black: dense, thick; Red: bright, almost maroon, fairly thick; White: thick, dull, often creamy white or light blue-gray, often flakes off. Pigments: Black: carbon, red: hematite, white: kaolin. Design: Usually completely covers bowl interiors and carries to rim, in few cases where white slip is applied only to portion of interior area, black decoration limited to white portion; very rarely red and white in combination on interiors in same manner as on exteriors; horizontal black stripe sometimes broken, frequently on bowl interiors, either at rim or about half way down side; bowl exteriors first painted in large irregular areas with white, then heavy black elements over white, leaving white visible around edges of black outline; the rest is red in areas not already covered in white; net effect balanced patterns of white and red, sometimes in angular masses, sometimes in scrolls, sometimes in panels or bands of one color separated by stripes of other color; black always used against white background, never against red background; pattern almost wholly of stripes and large, solid elements, often with scalloped or serrated edges, sometimes producing almost negative effect; hachuring rare; painted zone never extends much below greatest diameter of body; red below that point, where used as part of painted design; jar exteriors similar to bowl exteriors, red most frequently occurs in one or two encircling stripes, dividing surface into two or three bands of white on which is superimposed black decoration; brush work free, bold and rather careless. Comparisons: Pinto Polychrome, horizontal stripe or broken line never occurs, red never used as integral part of the design. Gila Polychrome, red never used as integral part of design, brush work somewhat better executed.